HARD ROCK CAFE HONG KONG. 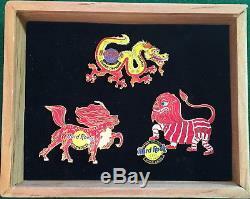 Set of 3 numbered pins - the dragon pin marks the opening of the Hong Kong cafe in new location and has'2002' on it - the lion pin marks the opening of The Peak merchandise store and has'2002' on it - the Kirin pin (Chinese mythology beast) marks the 1st anniversary of the cafe it has no date - all three pins come in a special wood box with sliding top. Pins made by PIN CRAFT with gold base metal. Pins are about 2 wide, tacs backs. 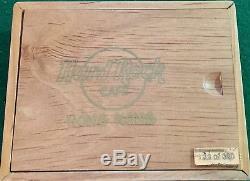 The item "Hard Rock Cafe HONG KONG 2002 GRAND OPENING 3 PIN Set Wood Box #138/300 #17268" is in sale since Monday, May 21, 2018. This item is in the category "Entertainment Memorabilia\Music Memorabilia\Rock & Pop\Artists H\Hard Rock Café\Pins". The seller is "rockyourpinworld" and is located in Orlando, Florida. This item can be shipped worldwide.